Golf Solitaire is a puzzle where you must arrange the cards making a series with values of +1 or -1 between each card. The longer the sequence the more points you win. 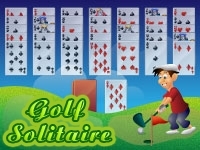 Golf solitaire is a traditional card game, played alone. It's very easy to learn, challenging to complete and satisfying to play. The aim of this game is to remove all of the cards from the columns. 5 cascading of columns of 7 cards are dealt, and the remainder (the stock) are placed face down in a pile at the bottom left of the screen. The top card of the stock is turned over and placed alongside to form the "foundation". You must now place exposed cards from the bottom of the columns onto the foundation, in ascending or descending numerical order - regardless of suite. For example: you can stack 10, 9, 8, 7 (ascending) then 8, 9, 8. Kings may be stacked on aces, and aces may be stacked on kings. In case of deadlock, you can click on the stock to receive a new card and start a new run, You you can play a joker as a starting card for a new run at any time (it need not continue the current run) - but it carries a heavy points penalty. - 1000 per Joker used. +200 per unused stock card card. -400 for each separate use of 'undo'. -100 for each subsequent, consecutive undo. Get big scores by building long runs. Tri Peaks Golf Solitaire is a variation of Golf Solitaire. The aim of this game is to remove the cards from the three pyramids into foundation. 30 cards are dealt into 3 pyramids of 10 cards, the remainder (the stock) are placed face down in a pile at the bottom of the screen. The top card of the stock is turned over and placed alongside to form the "foundation". You must now place exposed cards from the pyramids onto the foundation card, in ascending or descending numerical order - regardless of suite. -1000 a for a joker used. +3000 for completing the game. +400 per pyramid completed . +200 per stock card unused. The second tip is the use of wildcards. Following a long series, it may be advantageous to play the joker, this allows you to extend the current run starting at a new number. First, take your time and plan ahead to achieve the longest possible run, each additional card is woth 40 points more than the previous card. The second tip is the use of the joker, unlike in Golf Solitaire it is preferable to use the joker towards the beginning of the game with the aim of acheiving the longest possible run.